On Thursday, October 12th, NCJW Southern Maine Section partnered with the University of Southern Maine’s Jean Byers Sampson Center for Diversity to host a panel and community discussion about NCJW’s unique history serving Maine’s immigrant populations from the early 1900’s through today. 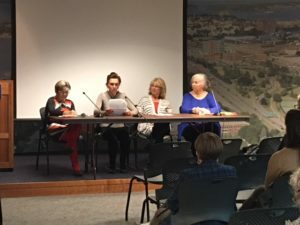 The panel consisted of two of our local members, Linda Rogoff (past Section President) and Bobbi Gordan, and Portland-born artist Jo Israelson. NCJW members highlighted all our key programs and great volunteer work dating back to House Island in the 1920s. Israelson spoke about her multi-media piece “Welcoming the Stranger”. She talked about her research into the women who founded our Section, research that she used to create the aprons for her piece “Sarah’s Generosity”. Several women from the Darfur community attended the program and thanked us for all our support. It was moving and a wonderful reminder of the importance of coming together as women for the greater good of our community. 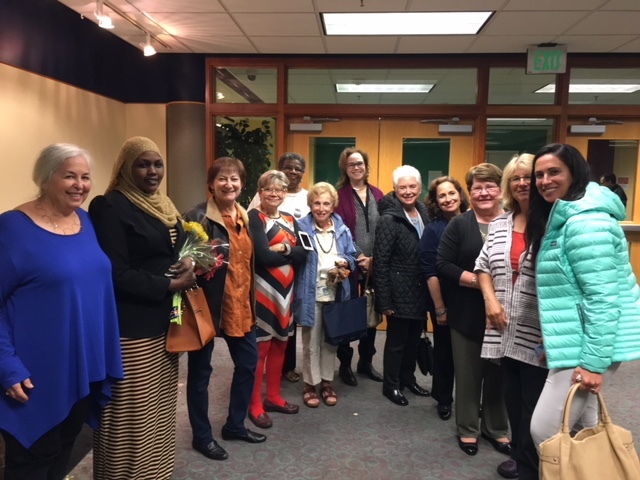 Looking ahead, in June of 2018, NCJW will be part of a larger immigration exhibit at the Maine State Museum in Augusta. Amy Waterman, a writer and museum specialist, spoke about curating the upcoming exhibit. This event highlighted how many women, children and families benefit from our programs. As an organization, we look forward to continuing to stand up for our those in need in our community.